These electronic media campaigns have been specifically designed to reduce misperceptions of student norms and thereby reduce levels of alcohol and other drug use and the resulting consequences. Examples of products produced are displayed here. 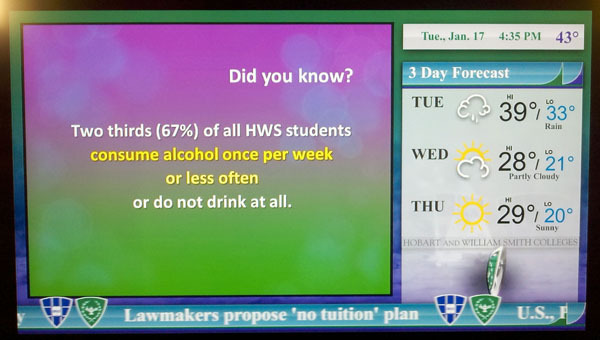 Digital Signage-Two high definition television channels display campus norms and other information to flat screen televisions across the HWS campus. One channel communicates information on the entire student body while the other channel focuses on student-athlete norms. In addition to animated screen displays of campus life and campus norms, RSS feeds of daily national news headlines, campus news headlines, and weather are displayed continuously. Students watch the channel to get local weather or news, and at the same time see campus norm information. To watch a video sample of this campus television feed, click the link above. Screen Saver- Broadcasts social norms messages from previously published Campus Factoids without relying on a user to start the program. This program has been installed in all open-access computer laboratories, the library, and now in all faculty, administrator, and office staff computers. The computer self-initiates this screen saver program. 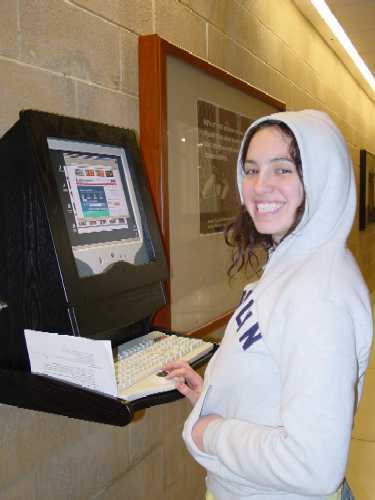 Kiosks- Flat-screen computers are mounted into cabinets in high-traffic areas of the athletic facilities. 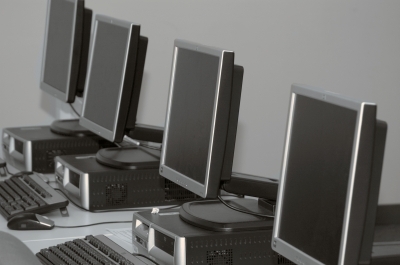 Each computer is connected to the campus network and offers students access to athlete and general campus databases through the Campus Factoids(TM) and MVP Factoids(TM) software applications. Web resources for athletes and the general student body may also be accessed through desktop icons on these workstations. When the software programs are not being accessed a screen saver displays random facts and photographs from the database. CD-Rom- Highlights and celebrates social norm facts and figures about HWS student-athletes on our campus with images and recent survey data. The CD-Rom also includes sport-schedules, team highlights, coach profiles, and coach and student videos. Multimedia Interactive Campus Factoids and Reactiods- Students can use this interface to browse previously published Campus Factoids and related student-produced videos, supplementary survey research data, and photos. The newest feature, Reactoids, allows students to respond to factoids, ad comments to the database, and suggest improvements. World Wide Web Site Resource for Students and Faculty- Brings social norms information while supporting academic work. Creates research resources for the campus community and delivers prevention messages along the way.